Designed with flair and created with loving attention to detail, we have cupcakes for every season and special occasion! We have a leading reputation for promotional products decorated with logos and company colours. 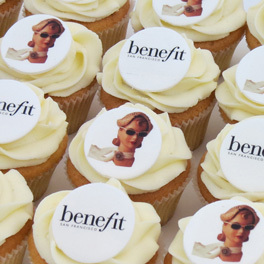 Exceptional quality and service is assured with our branded cupcakes. Nothing says happy birthday like a box of cupcakes - send them by couriered post or order them for a party to celebrate! Gorgeous, handmade and stylishly decorated with a swirl of buttercream frosting and delightful toppings. Here at The Little Cupcake Company, we lovingly make every single cupcake by hand with the greatest care from the finest fresh and natural ingredients, including free range eggs, fresh milk and real butter - just as you would do at home, only with bigger mixing bowls! The proof is in the eating and our cakes taste as good as they look! Our products can be personalised to add your own message in piped icing on top of lashings of tantalising buttercream frosting, and presented in luxury gift boxes with wide ribbons. They make an ideal gift and delicious treat, perfect for weddings, anniversaries, birthdays and celebratory events. 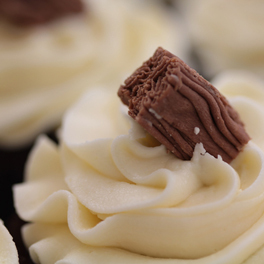 Take a look, indulge your senses and try one of our deliciously moreish cupcakes. We deliver on the date of your choice subject to availability – our integrated delivery calendar displays dates for delivery when you check out, so you can relax and look forward to the arrival of your order. We usually require a minimum of 24 hours after receiving your online order for your order to be delivered. Order online by 12pm for next day delivery across the UK or collect from our bakery.We deliver them by courier to ensure they arrive in pristine condition - see Delivery for more information. For corporate clients, we offer clients customised branding and packaging to suit your particular requirements. We can supply large volumes for events as well as promotional campaigns for corporate clients. We have an outstanding reputation for our customer service and the quality of our products. 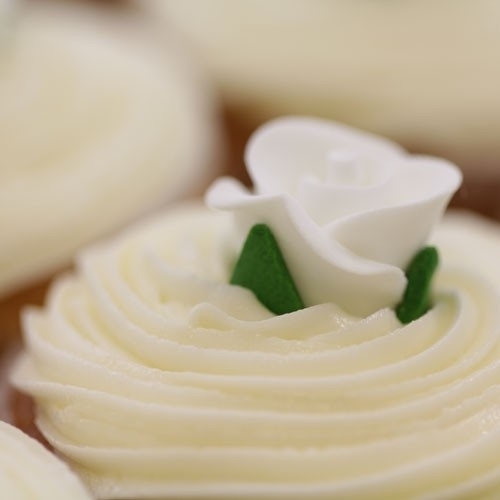 Our delicious cupcakes can be ordered online in minimum quantities of 12 loose cakes or in deluxe gift boxes of 9, 16 or 24 with luxury wide ribbons and delivered with a gift message on a card. Please note that all decorations and sprinkles displayed are subject to availability. You may also be interested in one of our temporary or permanent Display Stands, which are particularly suitable for parties and other special occasions, or in our range of cupcake-related Cards and Gifts.